The stamp set is a lamination one so I stamped the outline stamp first using Versafine black onyx ink. I then used kuretake clean colour pens directly onto the solid stamp and spritzed it with water before stamping over the outline. The sentiment was also stamped with versafine black onyx ink and a fine line pen used to frame the card. A few sequins were added to complete my card. I hope you like my make and thankyou for stopping by. 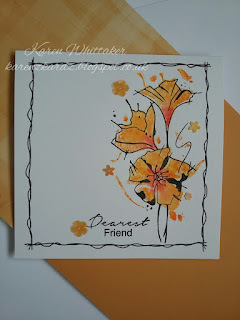 Oh, I have been loving your cards with this set, I REALLY love the orange! Stunning! I love these flowers and gorgeous colour too. Such a bright and cheering creation!